The Treasury Building was one of the first of many major government buildings designed by John James 'JJ' Clark. 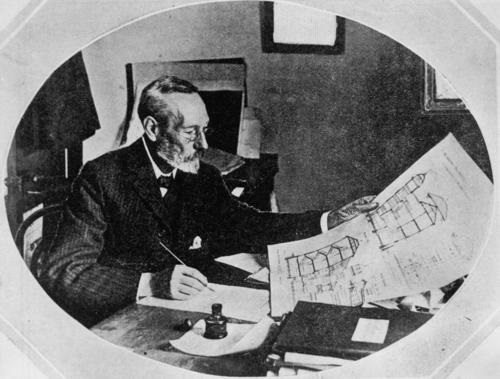 He began designing the building in 1857, at the age of nineteen. Born in Liverpool, England in 1838, JJ Clark arrived in Melbourne with his family in 1852. He immediately obtained work as a draftsman with the Public Works Department, and received his first commission in 1856, for the Government Printing Office. Clark toured Europe through 1858 to study Classical and Italian Renaissance architecture, and his completed designs for the Treasury Building reflect his passion for the style. JJ Clark’s many subsequent buildings in Melbourne, country Victoria, New South Wales, Queensland, Western Australia and New Zealand bear his signature style of elaborate ornamentation, grounded in Classical principles of proportion and balance. A devoted and tireless practitioner, Clark died in 1915, having never retired. His architectural legacy is among the most distinguished in Australia.